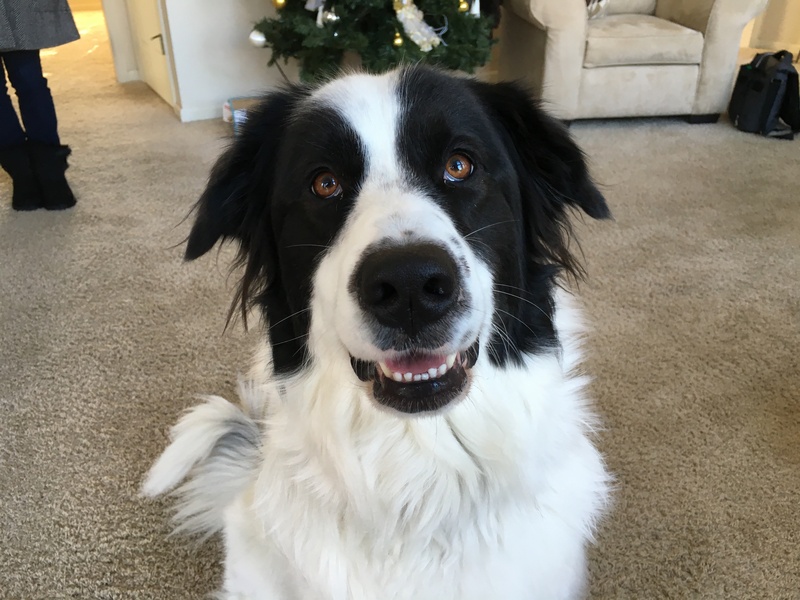 Núria is a two-year-old great Pyrenees Anatolian Shepherd mix who barks a lot at the wrong times, chases the cat and doesn’t respond well unless someone has a treat. While she was clearly excited to see me and didn’t show much respect for my personal space, Núria’s energy was about average and her behavior was far from the worst I’ve ever experienced, LOL. I sat down with her guardian and her family to discuss the situation. One of the families frustrations was the dog’s penchant for barking at the wrong times. Due to a new job, her guardian is going to be moving into a new city – likely in an apartment. Núria’s guardian was concerned that the dog’s unpredictable barking may come at the wrong time, i.e. when she is not at home. But unlike most of my clients with this problem, the guardian wanted the dog to bark in the appropriate times and situations. As we continued discussing things it quickly became clear that the guardians did not communicate to the dog during training that they wanted her to bark when she needed to go outside to eliminate. This is a common mistake many dog guardians make. But if we don’t brand or mark a word with an action at the beginning, its the same as a you asking someone who doesn’t know English to do something by asking in English. Once a dog associates a command word with an action or behavior, only then can you get the dog to obey on command. As we were wrapping up the barking segment of the session, I saw a Núria invade the personal space of every human in the room and It was pretty easy to see why. Each time the dog invaded the personal space of a human, they reached over and started to pet her. I consider petting a dog my way of paying the dog. Just like humans, it’s best to pay the dog when it provides a desired action or service. After all, if we got paid to do what we wanted to do, none of our employers would be very happy as we would be focusing on our personal needs..
To help the dog learn that obedience is desired and wanted, I went over a technique that I call Petting with a purpose. If all of the humans in the home make a concerted effort to only ptt the dog after it sits, lays down or recalls on command, it shouldn’t take Núria much more than a week before she starts engaging in these desired actions as her way of asking for attention from the humans. One of the other issues the guardian had was the dog’s refusal to recall on command consistently. This was a problem inside on occasion but more frequently when the dog was outside barking at something. In order to condition the dog to respond to whoever calls her, I went over a simple recall exercise that her guardian can practice inside and eventually transition to practicing outside. This will be an important skill to master with the dog while she still has the use of a fenced in backyard. In my discussion with her guardians, I learned that often they verbally reprimanded or corrected the dog. They also shoved her away when she didn’t oblige or listen. To help her guardian better disagree with Núria when she starts to engage in unwanted behaviors or actions (like invading someone’s personal space), I ran through a series of escalating consequences I like to apply when a dog breaks the rules. These nonverbal communication cues and consequences were molded on the interactions and behaviors that dogs use amongst themselves. As a result, Núria should respond to them much quicker than she does when her guardians push or shove her away. To help the humans practice utilizing these new communication methods, I walked the dog through a leadership exercise that I developed a few years ago. In addition to giving the humans the ability to practice using these escalating consequences, the exercise also helps the dog practice control and self-restraint. After running through it with Núria a few times myself, I was ready to coach her guardian through it. I suggested that all the members of the family practice the leadership exercise with the dog multiple times a day. At first they should conduct the exercise only until the dog lays down and then reward it. Once the dog is laying down right away, then they can start gradually increasing the amount of time they ask the dog to wait before they give it permission to claim its reward. By the end of the session Núria was behaving beautifully. She was responding to the recall right away, was keeping a respectful distance from anyone that she was near and following commands the first time they were given. I think the issues for the session were a result of the humans not clearly communicating what they did and did not want from the dog in a way it understood combined with rewarding the dog for engaging in unwanted actions and behaviors. Now that the humans are armed with new ways to disagree with unwanted actions and behaviors and are rewarding the dog for doing what they want, Núria’s unwanted behaviors should diminish or stop quite a bit. For the residual occasions that they return for, her guardian can use the new techniques to nip them in the bud for good.